NexusPremier 25-50 ton commercial rooftop line from Johnson Controls includes standard efficiency models that already comply with stringent Department of Energy (DOE) 2023 energy efficiency standards. Additional options are available for each tonnage to meet the Consortium for Energy Efficiency (CEE) 2019 highest tier ratings. NexusPremier rooftop units streamline the design process with integrated system selection tools, easily accessible building information modeling (BIM) files, improved submittals, and simplified specifications. 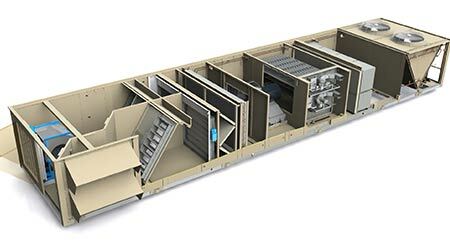 Additional flexibility is provided on high-performance base models through a complete range of factory options, including various airflow path configurations, indoor environmental quality options and modulating options for improved comfort. NexusPremier rooftop units are Smart Equipment enabled and offer start-up wizards and an array of user-adaptable parameters to help expedite start-up and commissioning. Smart Equipment provides complete control across multiple available rooftop units and integrates with interfaces, including zone controllers and other building controls systems such as Verasys. The Navigator product service app enables on-demand access to unit-specific details, technical literature and a direct connection to technical support via a unique QR code on each rooftop unit. An optional Mobile Access Portal (MAP) provides remote monitoring capability.